Crop production is strongly influenced by soil parameters and current climatic conditions. These factors determine the growth potential of a specific field. A number of tradeoffs a farmer has to take usually decrease the yield he obtains, compared to the site’s potential. This so-called yield gap leads to a utilization of only 20% (in smallholder markets) to 80% (in professional markets) of the yield potential. One possibility to close this gap is to provide farmers with insights – the combination of data and knowledge. In the past decades, the possibilities to gather data on farms massively increased, but the breakthrough of precision farming did not yet happen as link from data acquisition to actionable recommendation is often lacking. 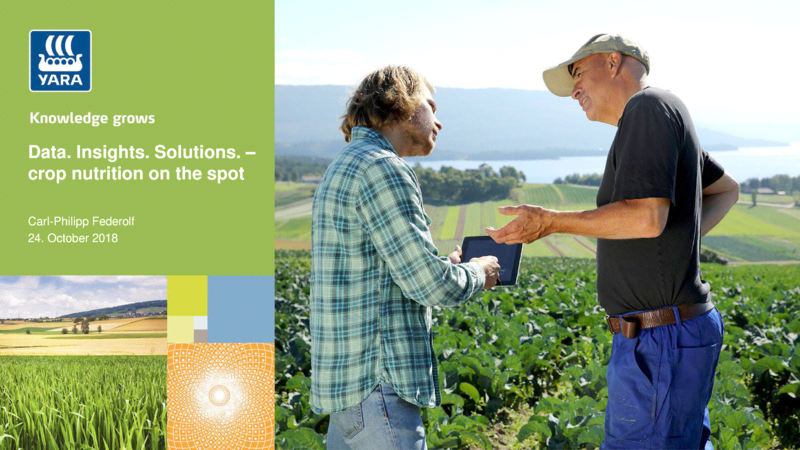 Yara has a record of providing tools that automatically deliver adapted recommendations to farmers, however – they require significant investments in physical sensors. Latest developments in the remote sensing area open opportunities to open this knowledge to a broader range of farmers. Delivering these insights and recommendations based on a combination of remote and on-field sensing an in a useful way to the farmer, requires deep knowledge in number of disciplines like agronomy and GeoIT, but also AI and user experience design.